GE’s new Center for Additive Technology Advancement (CATA) looks like a futuristic set for a Stanley Kubrick movie. Everything seems to be white: the walls, the gleaming floors, even the noise from rows of laser-powered 3D printers near the entrance, quietly making everything from jet engine blades to oil valves. Located by a new highway exit just minutes from the Pittsburgh airport, the center, which opened in April, is so new even Uber drivers require human navigation. But the center is no mirage. Few cities embody the boom-and-bust cycle of American industry more than Pittsburgh. Today there are no steel mills left, but the city is rising again, in part because it focused on science, research and education. Carnegie Mellon University is the place to study robotics, Google and Tesla Motors opened offices here and the world’s most sustainable building is located at the Phipps Conservatory and Botanical Gardens. “We’ve tapped into America’s best-kept secret,” says Jennifer Cipolla, who runs CATA. That’s why CATA also has an “industrialization lab,” where GE businesses can bring their 3D designs and figure out how to speed up the process from lab- to full-scale production. Cipolla and her team will help them optimize the design and simulate what actual production would look like. GE invested nearly $40 million in CATA, which will employ 50 workers. 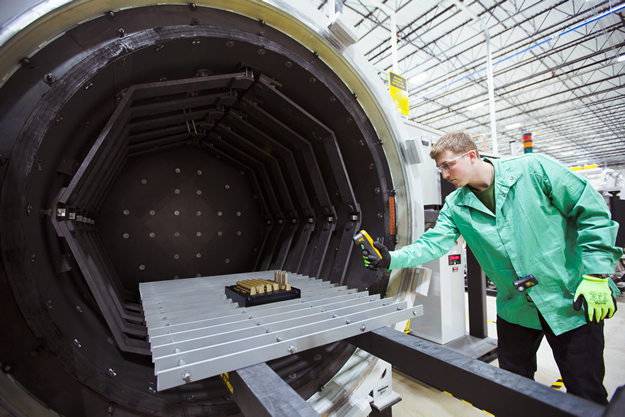 The facility has several direct metal laser melting (DMLM) machines, which can print parts in metal alloys. The company is planning to add $10 million worth of machines this year, including a $2 million DMLM printer with four lasers that can print four different parts at the same time and a laser hot-wire machine that can quickly and precisely restore worn-out parts. Each DMLM machine breaks down a CAD design file layer by layer and uses the laser to fuse one fine layer on metal powder after another in the right design pattern. Each layer is between 20 to 80 microns thick and there are as many as 1,250 layers per inch — each less than the thickness of a human hair. The laser power ranges from 400 watts to 1 kilowatt, enough to burn a hole in a wall. “It’s exactly like welding, but on a microscopic scale,” says Brian Adkins, additive manufacturing engineer in charge of the machines. The machines have applications from prototyping to tooling. Last week Rowley was printing an LED chandelier designed by the GE energy startup Current. It’s currently displayed in the lobby of the CATA facility. GE Reports visited CATA last week. Take a look. Source: GE Reports – To read the article on GE Report’s website, press here. This entry was posted in News and tagged Brian Adkins, CATA, Center for Additive Technology Advancement, Dave Miller, Ed Rowley, GE, GE Aviation, GE Reports, Jennifer Cipolla by AM. Bookmark the permalink.